The estate was created by Francis Leggett in the early 1890s; he later became a friend of Swami Vivekananda and the first president of the Vedanta Society of New York (founded by Swamiji in 1894). 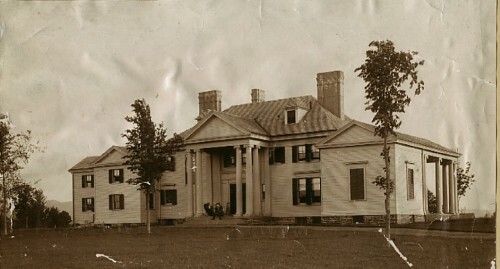 Ridgely has been the home of Leggett’s heirs since his death in 1909. While visiting America in 1993, Swami Gahanananda, vice-president of the Ramakrishna Order encouraged the Vedanta societies to purchase the Ridgely property. After some time the newly formed Sri Sarada Society worked for several years to acquire it. A portrait of Francis Leggett from a family album. In March 1997 the Trustees of the Ramakrishna Math & Ramakrishna Mission(Belur Math, India) decided to seriously pursue the acquisition of Ridgely.Persistent efforts included a thorough feasibility study, which enabled Swami Swahananda to authorize the purchase of Ridgely. A large downpayment, offered by devotees in America, was accepted in August, 1997, and by May 1999 a total of over $1.2 million was raised. With the help of an interest-freeloan of $400,000 that was given to the retreat, the mortgage was paid in full by mid summer 1999. As of January 2005 the interest-free loan was also paid back in full. This was made possible through a bequest of Sister Gargi (Marie Louise Burke) and the generous donations of many people. Since 1997,we have raised over$2 million that has permitted us to purchase the property, convert the property from private to public use, pay off the loan,and make needed renovations and improvements. Going forward, our fund raising efforts must be directed toward the establishment of an endowment fund to ensure Ridgely’s long-term security! You can read a detailed account of Swami Vivekananda at Ridgely in a chapter titled “The Great Summer” in Swami Vivekananda and the West: New Discoveries by Marie Louise Burke. Please also see the history of Vivekananda Retreat Ridgely.